“It was the jam that never happened, the one that got away,” said David A. Ross, a young museum assistant at the time who’d go on to a distinguished career as a museum director, curator and writer. Ringo did a little news conference Friday before he and his “All-Starr Band” – Todd Rundgren, Gregg Rolie, Steve Lukather, Richard Page, Warren Ham and Gregg Bissonette – began a tour at the new Lakeview Amphitheater on the shoreline of Onondaga Lake, near Syracuse. The band moves on Saturday to the Seneca Allegany Resort & Casino, in Salamanca. Ringo is 75 now – if you’re a Baby Boomer, that’s a number hard to contemplate – but I wanted to ask him about that Syracuse gathering, long ago. I wrote a piece about it in 2005 for The Syracuse Post-Standard, and the guys who told me the tale were Ross and James Harithas. Harithas is a former curator of the Contemporary Art Museum in Houston, while Ross - chair of art practice at the School of Visual Arts, in New York City - has served as director of the San Francisco Museum of Modern Art, the Whitney Museum of American Art and the Boston Institute of Contemporary Art. They shared this recollection: In 1971, when Yoko Ono did her first major art show, “This is not here,” at the Everson Museum of Art in Syracuse, part of the lofty vision was assembling The Beatles – at least Ringo, John Lennon and George Harrison - for an impromptu midnight concert at the Everson in honor of Lennon’s 31st birthday on Oct. 9 of that year. “God, it would have been amazing,” Ross said Friday. 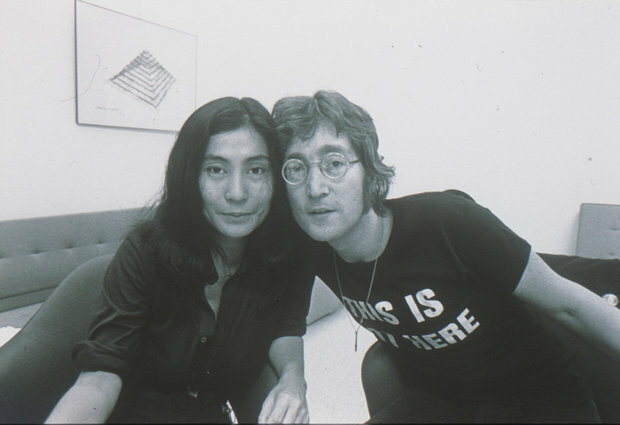 Yoko Ono and John Lennon at the Everson Museum of Art, Syracuse, 1971; photo courtesy of the Everson. Ringo was there. He came to the opening of the show with his then-wife, Maureen Starkey Tigrett. But George Harrison couldn’t make it to Syracuse that night, choosing to visit Ono's show later. Harithas once told me the early dream involved inviting Paul McCartney, but McCartney and Lennon at that moment were estranged, their emotional collision at the core of the disintegration of the band. At the time, Ross was a young aide to Harithas, then-director of the Everson. Ross recalled how Apple Records, The Beatles' recording label, flew in a chartered plane on the morning of Oct. 8, a plane loaded with storied musicians. Ringo was on it, Ross said, as were such renowned sessions musicians as keyboardist Nicky Hopkins, drummer Jim Keltner - and Klaus Voorman, who’d collaborated musically and artistically with several of The Beatles. Also on hand: Phil Spector, the famed “Wall of Sound” producer now doing prison time for the killing of actress Lana Clarkson, and celebrated Beat poet Allen Ginsberg. Several accounts say Eric Clapton was in Syracuse, and Lennon and Ono wrote a song – “Attica State,” inspired by the prison uprising – in the hours before the birthday celebration. Ross said he was instructed to find guitars and other instruments that could be used in a midnight concert in a small auditorium at the Everson, a surprise gift for Lennon in a magnificent building designed by I.M. Pei, one of the world's great architects. The performance didn’t happen, which leaves Ross feeling wistful to this day. Word got out about the potential show, and fans tried to push their way into the museum. In the end, Lennon, Ono, Ringo and all the guests retreated to a room in the nearby Hotel Syracuse, where they did an impromptu jam while sitting in a circle, Ringo using any object he could find for percussion. The Beatles had dissolved the previous year, and the band remained the focus of international attention: “An extraordinary phenomenon,” as Ross put it. Ono and Lennon descended on Upstate New York with the force of a celebrity comet. The Beatles never played a concert in any of the big Upstate cities, and the appearance of Lennon and Ringo was as good as it could get for countless fans in this region who revered them. The idea of a Syracuse reunion was reinforced years later by May Pang, who was Lennon’s romantic partner for a time in the 1970s. In several interviews, she recounted how Lennon and McCartney spent some time together in California in 1974, and how they daydreamed about the idea of again writing some songs together. They discussed doing it in Syracuse, Pang said, because it was relatively close to New York City, yet outside Manhattan's media spotlight – and perhaps because Lennon had warm memories of the time that he spent there. As for Ringo, legendary rock critic Robert Christgau made mention of the Syracuse visit in Christgau's 1980 eulogy for Lennon in the Village Voice, after the rock genius was murdered in New York City. Christgau recalled a visit with Lennon and Ringo in a room at the Hotel Syracuse just before the 1971 birthday party, and how Starr expressed frustration about a long wait for room service. Lennon told the humble and low-key drummer to tell the staff he was a Beatle, and that he wanted a faster response. That wasn’t Ringo’s style then, and it wasn’t his style Friday before the show near Syracuse. At the news conference, he was funny, self-effacing and complimentary about the new Onondaga County amphitheater: "Honestly," he said, "a beautiful place." He spoke of loving music since he was a child, how he bought his first drum set at 17 and almost immediately turned it into his full-time passion. "I'm just so grateful I'm still at it," he said, emphasizing that every performance is a thrill. He used the word "love" in describing how he feels about the musicians in the All-Starr Band, a reverence these rock legends clearly returned, and he showed little interest in talking about the "other band" that made him famous. Still, after waiting many years, I finally got the chance to ask a couple of questions: Did he remember the tumult surrounding Lennon's 31st birthday, all those great musicians gathered in one place? Most important, did he recall an attempt - during Ono's art show - to reunite The Beatles? Ringo contemplated the matter and then said, with emphasis: "I remember absolutely nothing." He said he couldn't recall that visit to Syracuse at all. Ringo was warm and gracious about the question. He laughed and said he could stand on the stage and make something up, "I remember this or I remember that," but it was deep in the past and he had no memories of the Syracuse event. He was clearly more excited about talking about his life as it is now, about this tour and where he is going in the future. So in the end, Ringo neither killed the reunion story, nor confirmed it. He just let it be.